From the end of the 14th century the city was the seat of the Archbishopric of Salzburg, a prince-bishopric of the Holy Roman Empire. The controlling Prince Archbishops lavished their wealth on a fortress above the town, and the city palaces and the churches, while the prosperous local merchants built imposing five-storey residences beside the Salzach River. Set against a backdrop of the snow-capped Alps, Salzburg, radiates Old World charm. The Old Town”, a UNESCO World Cultural Heritage site, is chocked full of cobblestone streets, Medieval and Baroque buildings, palaces, concert halls, monasteries and more. This is a city with a burgeoning arts scene, wonderful food, manicured parks, and concert halls that uphold musical tradition 365 days a year. Salzburg’s most visible landmark is the 900-year-old cliff-top fortress Festung Hohensalzburg, one of the biggest and best preserved medieval castles in Europe. It was built in 1077, and offers magnificent views over the city’s spires, the Salzach River and the mountains. It’s a steep 15-minute walk from the centre, or take the glass Festungsbahn funicular. Don’t miss the Golden Hall with its gold-studded ceiling imitating a starry night sky. Concerts are often held here. Much of Salzburg’s grandeur, including the cathedral, is due to Archbishop Wolf Dietrich von Raitenau. Arriving from Rome in 1587, he set out to create a Baroque city north of the Alps as splendid as Rome. The cathedral is a masterpiece of baroque art. In the nave, the intricate stucco and ceiling frescoes depicting the Passion of Christ guide the eye to the polychrome dome. For two years Mozart served as organist here. Handsome St. Peter’s Church dates back to the 12th Century, although the layout and decor were updated during the Baroque era. The graveyard next to the church is also worth a visit, and hourly Catacombs tours are scheduled from May through September. The prince-archbishops lived in the Residenz after they moved from Hohensalzburg fortress. You can visit the art gallery, take a guided tour of the State Rooms (in German), or buy a combination ticket for both. 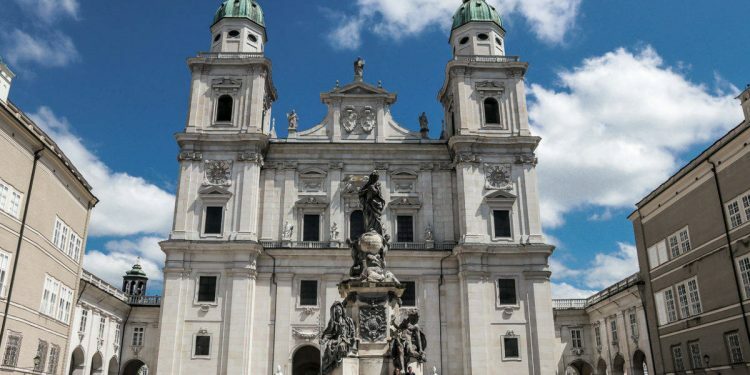 Art lovers and museum-fiends will also find plenty of ways to keep themselves entertained, since Salzburg prides itself on being a destination for culture. Perhaps the city’s most enduring cultural celebration is its annual Summer Festival. Founded by Max Reinhardt and Richard Strauss in the nineteen twenties, it has blossomed into one of the world’s greatest musical gatherings. Salzburg was the birthplace of 18th-century composer Wolfgang Amadeus Mozart. There’s a Mozart College for musicians, and plenty of opportunities to hear his music. Mozart was born in 1756 and lived in the city until age 25, when he left after a falling out with the reigning archbishop. Mozart’s birthplace is in the Old Town where his family lived until he was 17. Memorabilia on display include his first violin, given to him at the age of six. The much grander Mozart’s Residence, where the family lived from 1773 to 1787, is used to display exhibitions about the composer. The Mirabell Gardens, just across the river from the Old Town was where the end of the Do-Re-Mi sequence in The Sound of Music was filmed. There is a great view back to the Old Town from here. Another film location is found if you walk down the path around the back of the castle. Nonnberg Abbey was where Maria was a novice and where the opening convent scenes of the movie were filmed. An elevator inside the steep cliff of the Mönchsberg takes you to the Museum der Moderne. Some say the view and the cafe are more impressive than the museum. The Salzburg Museum, however, provides an excellent history lesson about the city and its past and present citizens. Some way out of town, the 17th-century Hellbrunn Palace and gardens was built as the Archbishop’s summer day residence, and there are some fine painted interiors. There are many food options in Salzburg. One favourite is the Augustiner beer garden, a huge 1,000-seat place within a brewery that is usually packed with people enjoying traditional food and beer drawn from old-time wooden kegs. The city’s best nightlife is in Steingasse, a medieval street with a number of lively bars. The Salzburg Card costs around A$53 for 48 hours and allows entry to all the top sights and free public transport. It is excellent value.